PFF’s Nathan Jahnke has taken a deep dive into the numbers to find an interesting piece of information about all 32 teams after 13 weeks of football. If you would like to make some observations of your own, you can do so with PFF Elite, where you can find several signature statistics for every offensive and defensive position in football, thanks to Premium Stats 2.0. Buffalo Bills: Kicker Stephen Hauschka has made 43 consecutive field goals within 40 yards. That is the longest active streak among kickers. New England Patriots: James White has 36 catches on second down. That is the most by any running back this year. If he gets one per game the rest of the season, he will have the most for any back in a season in the last 13 years. New York Jets: Cornerback Morris Claiborne has ten pass breakups this year, which is tied for the most among all cornerbacks. 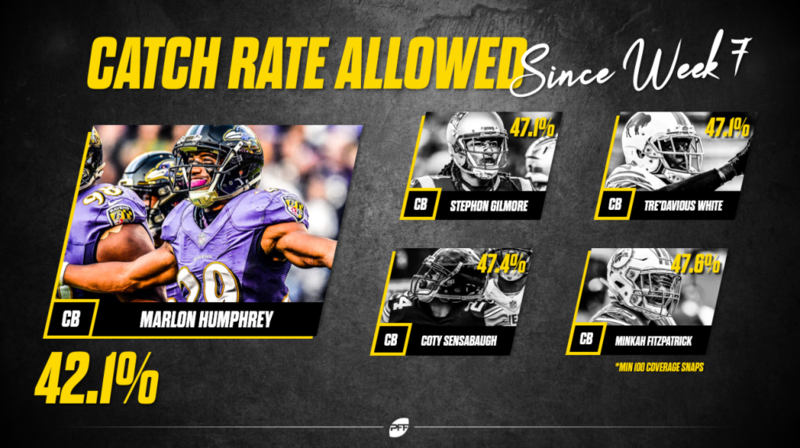 Baltimore Ravens: Marlon Humphrey has allowed a catch rate of 42.1% since Week 7, which is the best for cornerbacks in that time. Cincinnati Bengals: Interior defender Andrew Billings has 16 run stops since Week 7, which is the second-most for all interior defenders in that span. Cleveland Browns: Nick Chubb is averaging 4.5 yards after contact per carry. If he finishes the season at that rate, it will be the best mark of the PFF era. Pittsburgh Steelers: Coty Sensabaugh has allowed 0.42 yards per coverage snap since Week 7, which is the second-best for all cornerbacks in that time. Houston Texans: Since Week 7, Whitney Mercilus has produced pressure on 17.4% of his pass rushes, which is the second-highest rate among all edge defenders in that span. Indianapolis Colts: Anthony Walker has 29 run stops, which is tied for second-most among all linebackers. Teammate Darius Leonard is one of the players he is tied with. Jacksonville Jaguars: Tashaun Gipson Sr. has six pass breakups this season, which is the most among safeties. Tennessee Titans: When opponents are in the red zone, Jurrell Casey has gotten pressure on 20% of his pass rushes, which is the second-best rate for all interior defenders. Denver Broncos: Phillip Lindsay is gaining five or more yards on 45.5% of his carries. That is the best rate for a rookie with at least 150 carries in the last 13 seasons. Kansas City Chiefs: Mitchell Schwartz has allowed pressure on 2.5% of pass blocks this season. That is the lowest rate for a right tackle in the last decade. 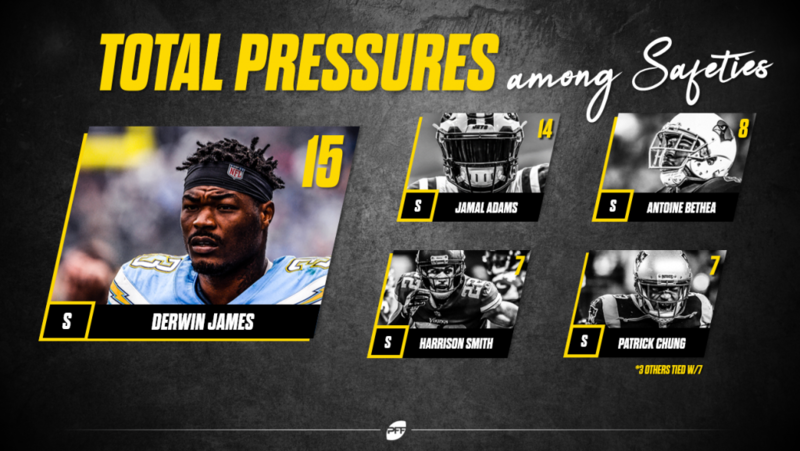 Los Angeles Chargers: Derwin James has produced 15 pressures on his pass-rushing snaps, which is the most among all safeties. If he continues at his current rate of more than one pressure per game, he’ll set the PFF record for the most pressures produced by a safety in a season. Oakland Raiders: Since Week 5, centers across the NFL have allowed 345 pressures, an average of just under 11 per team. Raiders center Rodney Hudson, who has taken every offensive snap in that time, has allowed just one pressure. Dallas Cowboys: Ezekiel Elliott has 22 carries of 15 or more yards this season. No other back has more than 16. The only running back with more than that in a season since 2015 was Ezekiel Elliott in 2016, with 23. New York Giants: Since the start of the 2016 season, Landon Collins has 71 run stops, which is 21 more than any other safety in that time. Philadelphia Eagles: Lane Johnson has gone 89 consecutive pass blocks without allowing a pressure, which is the longest current streak among right tackles. Washington: Fabian Moreau has played 40 coverage snaps in the red zone this season which is second-most for cornerbacks. In that time he has only been thrown at once, and that pass was incomplete. Chicago Bears: Tarik Cohen has 2.78 yards per route run, which is the best for all running backs this season. Detroit Lions: Ezekiel Ansah has gotten pressure on 29% of his third-down pass rushes this season, which is the highest rate for defensive players. Green Bay Packers: Blake Martinez has 19 stops on pass plays, which is the most for all linebackers this season. Minnesota Vikings: Kyle Rudolph has made 58 consecutive catches, dating back to last season, without a drop. That is the longest active streak among tight ends. Atlanta Falcons: Deion Jones returned to the Falcons this past week. Since being drafted in 2016, he has eight interceptions (which is tied for the most among linebackers), and 17 pass breakups (which is five more than any other linebacker). He’s done this despite only playing in two games this season. 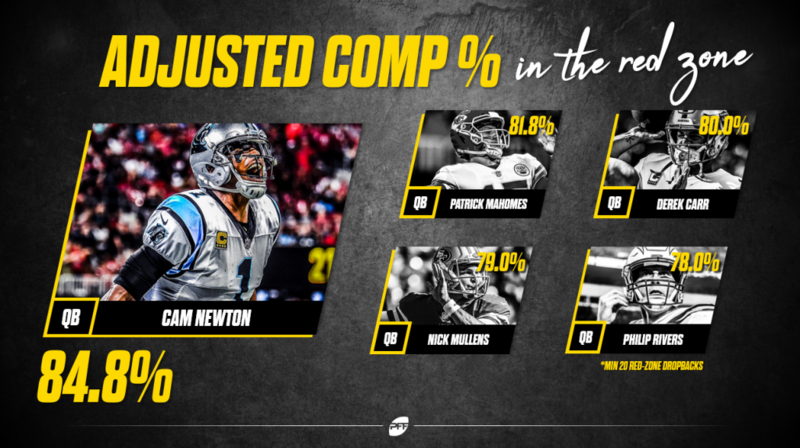 Carolina Panthers: When the Panthers are in the red zone, Cam Newton has an adjusted completion percentage of 84.8%, which is the best for all quarterbacks this season. New Orleans Saints: Michael Thomas has a catch rate of 86.7%. That is over 5% more than any other wide receiver in a season over the past decade with 100 or more targets. Tampa Bay Buccaneers: Since Week 7, Jason Pierre-Paul has 13 run stops which are second-most for all edge defenders. Arizona Cardinals: Patrick Peterson has allowed 80 or fewer receiving yards in each of his last 67 games dating back to 2014, which is the longest streak we’ve seen from a defensive player in the 13 years we have data for. Los Angeles Rams: When opponents are in the red zone, edge defender John Franklin-Myers has gotten pressure on 22.6% of his pass rushes, which is third-best for all edge defenders. San Francisco 49ers: DeForest Buckner has 14 straight games with 2 or more pressures, which is the second-longest streak for all interior defenders. Seattle Seahawks: When Frank Clark lines up on the defense’s right side, he has a sack rate of 4.3% this year, which is the best among all edge defenders.